The new gaming keyboard unveiled at nyc technology events, features what Roccat calls “membranical” keys. Supposedly, it’s a hybrid between a membrane and mechanical keyboard. While there aren’t a lot of details on these, ROCCAT says they have a fast mid-travel actuation point as well as a silent typing feel (no clicking). The keys are ‘mid-height’ with an actuation speed of 7.8ms for the regular keys and 5ms on the low profile macro buttons. 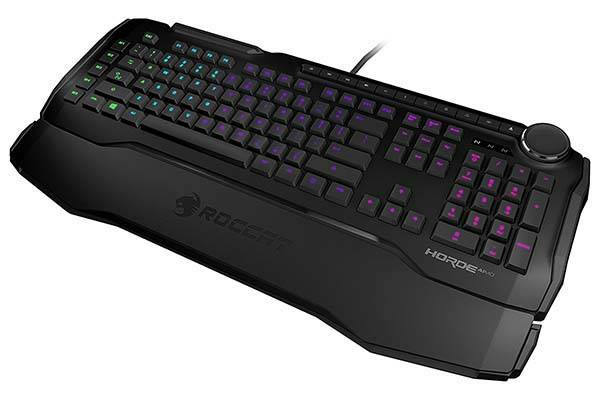 ROCCAT compares this to a standard membrane keyboard at 9ms but does not reference mechanical keyboard latency. Additionally, the keys sit in a laptop-like island layout said to resist dirt. Another unique feature on the keyboard is the Tuning Wheel located on the upper right-hand corner. This wheel, and its associated buttons surrounding it, provides control from multimedia, illumination, brightness, DPI, volume, and is Windows Dial compatible. When rotated the wheel gives users a tactile response when turning (20 steps for 360°). The wheel can also be customized through the Swarm software as well as through Windows settings.